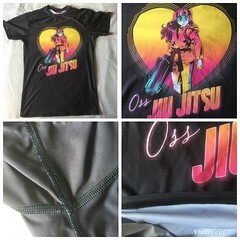 Jiu Jitsu Boyfriends Rashguard Review – A rashie created to help support the @jiujitsu_boyfriends comics and social media. Mat Therapy Warrior Princess Rashguard – The perfect rashguard for your inner wonder woman! Grrrl Japanese Floral Short Sleeve Rashie – A great value rashguard option for women of all shapes and sizes. Gamma Fightwear – White as Snow Spats – A fabulous female friendly and British based supplier of unique spats and rashguards. Rainha Fightwear “The First” Rashguard – It was pleasure to review one of the first products from this new UK based female fighter brand. 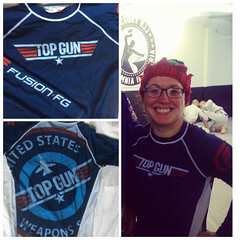 Fusion Fight Gear “Top Gun” Rash Guard– Perfect for stepping into the “danger zone”! 93 Brand “Donuts” Rashguard – Donuts and a well-fitting rash guard! What more do you need??? Ok maybe Bananas!